Multiple tests of the Lorena stove beginning in 1983 at the Aprovecho Research Center have shown that placing thermal mass near the fire has a negative effect on the responsiveness and fuel efficiency of a cooking stove. In 1996, Leoni Mvungi built a Rocket stove from earth, sand, and clay that was a replica of a low mass Rocket consisting of metal chimney parts. His version weighed hundreds of pounds even though the Rocket internal chimney was only eleven inches high. Tests of a low mass sheet metal version scored around 30% fuel efficiency. But the best result achieved by the Mvungi stove was around 15%. Building Rocket stoves from sand and clay showed little promise of improving on the three stone fire which was scoring around 18% in repeated boiling tests performed by Jim Kness and Dean Still (1994). Unfortunately, metal stove parts also have a major drawback in that the high heat in the combustion chamber quickly destroys thin metal. Consultants were in agreement that a good stove should last for years without requiring maintenance. Replacing metal parts as they wear out was not considered a viable solution. A women's co-operative in Honduras (Nueva Esperansa) makes ceramic stove parts that have a reputation for working well in stoves. Aprovecho consultants Mike Hatfield and Peter Scott contracted with this group to produce combustion chambers for the Dona Justa plancha stoves that they helped to design. This material seemed to work well and, in fact, the Rocket elbow made by Nueva Esperansa has been successful in Honduras and Nicaragua. It is difficult, however, to deliver the fragile combustion chambers without breaking them. Also they are relatively expensive, costing about eight dollars each. Don O'Neal (HELPS International) and Dr. Larry Winiarski have shown that cast iron combustion chambers, which do last, also have problems. Tests showed that the very conductive cast iron made the fire hard to start. In fact, a group of indigenous Guatemalan women stove testers living in Santa Avelina were unhappy with the expensive cast iron combustion chamber and asked for it to be replaced. They wanted a more responsive stove that started quickly, and quickly cooked food in the morning. Don and Larry eventually found an alternative material: an inexpensive Guatemalan ceramic floor tile (called a baldosa in Spanish) which seemed to function well when cut up to make the walls of the Rocket combustion chamber. The baldosa was about an inch thick so the combustion chamber only weighed eighteen and a half pounds. Like all Rocket combustion chambers it is surrounded by insulation, either wood ash or pumice rock. The baldosa tile has done well in test stoves. It seems to be durable, lasting a year so far, and the group of testers from Santa Avelina reported that their stoves are much improved. The ceramic material made the stove much quicker to heat up. The women approved the improved stove for general dissemination to neighbors and other villages. The HELPS molded griddle stove now uses a preformed ceramic combustion chamber made by a local baldosa manufacturer. Unfortunately, all baldosa are not equally resistant to heat and it's important to test tiles before using them in stoves. Appreciating that ceramic seemed a promising material for Rocket combustion chambers, Ken Goyer, an Aprovecho Board Member and consultant, spent a year, 2000-2001, testing ceramic mixes. His research resulted in a vernacular insulative ceramic material (VIC) that is refractory, insulative and can be home made. Six bricks made from this material combine to make a complete Rocket combustion chamber. Making the chamber from separate bricks has resulted in a greatly reduced tendency to crack. The bricks have held up so far in durability tests and they seem to create a very active fire. The purpose of this paper is to describe the results of experiments involving same sized brick combustion chambers made from adobe, the insulative ceramic mix and common ceramic brick material. All bricks shared the same dimensions. Six bricks (11 ½" high by 2 ½" thick) made up a hexagonal cylinder surrounding a four inch in diameter chimney. Sticks of wood entered the bottom of the chimney through a hole sawn in the bricks. 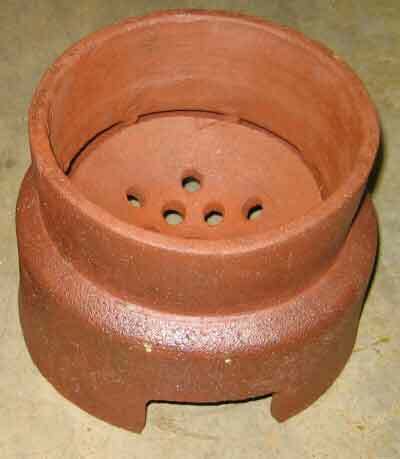 A combustion chamber made to similar dimensions was constructed using baldosa tile bought in Guatemala. Vermiculite filled in around the baldosa creating a combustion chamber with approximately the same dimensions as the brick stoves.